Many of us remember the brilliant idea of Oreo Cookies during the Super Bowl’s black out. 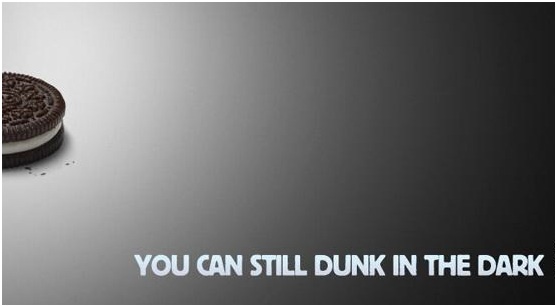 For those who do not know about it or need a small reminder, Oreo Cookies had tweeted a photo that included the message “You can still dunk in the dark” straight after the electricity stopped working. This decision, apart from helping the company to gain the impressions, resulted in 13,734 retweets in zero time! In fact, real-time marketing has proven beneficial for many businesses with one great example being the campaign of P&G “The man your man could smell like”. But enough with the Social Media, what about AdWords? IC Filling Systems is a traditional family business which specialises in filling and packaging machinery for liquid products such as water, soft drinks, beer and wine. When we started managing their AdWords account, we noticed that the competition was very high while the monthly relevant searches were comparatively low. As a result the minimum required bid was around £2. Our aim from that point was to find a way to reduce their cost-per-click without decreasing the website’s traffic. Few weeks later, as we were discussing the next strategic steps, our client mentioned that IC Filling Systems would participate in Drinktec; the world’s leading fair trade for the beverage and liquid food industry. The next step was to create a CPC campaign that would target only the name of the exhibition. The generated Ad was very clear and was simply mentioning the services of IC Filling Systems and their stand. Surprisingly the average CPC was only £0.14 and this means that we managed to reduce their cost by 93%. On the other hand, the number of visitors increased significantly. Why do online customers abandon shopping carts?